A Haunting on the Screen: Frogs! "Frogs" (1972) is a campy horror movie starring Ray Milland, Sam Elliott, Joan Van Ark and Judy Pace about the wealthy Crockett family that gets together around the 4th of July at their patriarch's mansion on their private island in Florida just in time for all of nature's creatures to attack! Pickett Smith (Sam Elliot) is a freelance photographer / environmentalist who is canoeing around the swamps and lakes of Florida getting shots of nature under attack by human waste and garbage. Clint (Adam Roark) and Karen Crockett (Joan Van Ark) are siblings out for a joyride in the family speedboat and they carelessly swamp Pickett's canoe. They offer to bring him to Grandpa's house so he can get dried out. Little does Pickett know what is about to occur on the island. The Crockett estate is a beautiful southern mansion on its own island. Jason Crockett (Ray Milland) is the crotchety head of the family who gathers his children and grandchildren to his estate for a couple weeks each summer. During that time they have meals and play the same games according to all the family traditions. Each of the family members seems to have issues but all gladly come to the island each year and takes his orders in hope that they will remain in the old man's good graces and thus his will. As soon as Pickett arrives, he hears everyone complaining about all the frogs in and around the estate this year and how they keep them up. Jason asks Pickett what poisons they can use to get rid of them. Well, over the week - Pickett keeps getting pulled in deeper and finds a love interest in Karen, all of nature's creatures in the area go on the offensive and start killing off the family members one by one. There are snakes, spiders, lizards, birds, alligators and frogs all taking their turns going after the humans that have been poisoning their environments. Who will get safely away from the island! Will it be any better on the mainland? 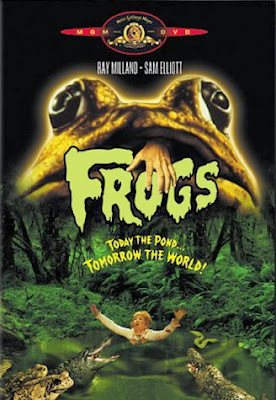 "Frogs" is pure 70s horror fun!